The first written valentines were sent in the 1400s and continued to be popular as they are today. Poetry was composed. Cards and tokens were handmade with love and care for that special someone. 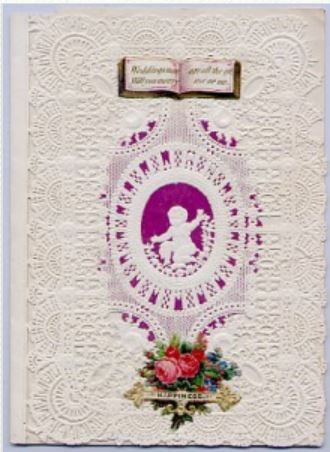 But in 1848, inspired by an English valentine card she had received, the “Mother of Valentine”, Ester A, Howland, daughter of a book and stationery manufacturer, began selling valentines produced using an all-female assembly line (long before Henry Ford’s) in her home. with Internet cards – the ability to insert the verse of your choice in the card. Venders were provided with 131 verses for the purchaser to glue inside the cover of they had picked. 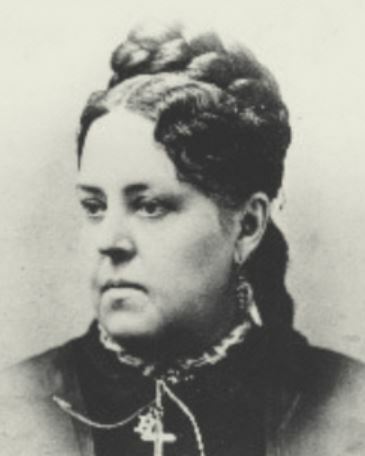 She named her company the New England Valentine Company [stamped NEVco], and it is estimated she earned an incredible $25,000 to $75,000 a year from the business which lasted to 1888 when she sold out to her competitor. 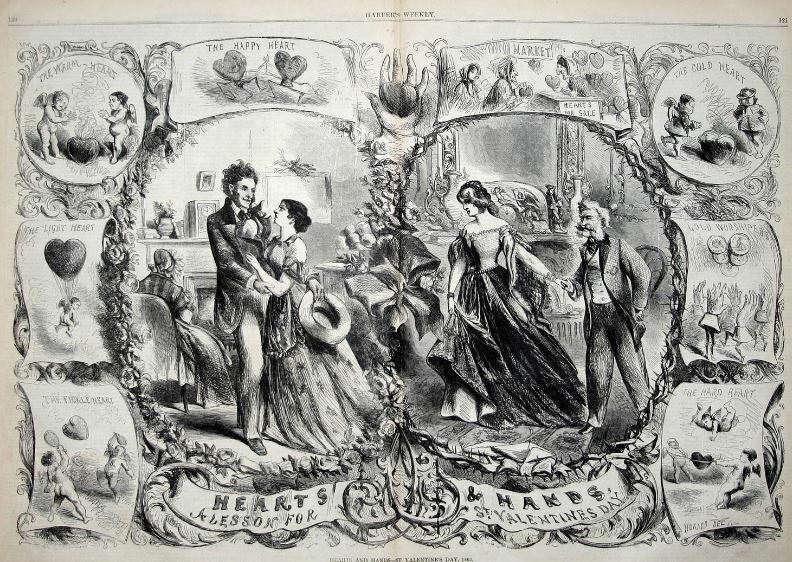 Valentine cards were especially important during the Civil War when husbands and wives, and young lovers were separated not only by miles but by the fear they would never see each other again. 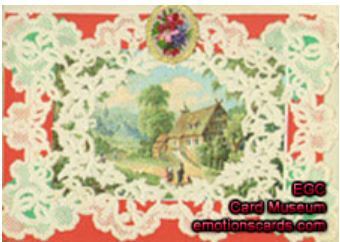 Cards made by Howland and her competitors were sent by those who could afford them and had access to stores. However, out in the field many soldiers made their own cards using what materials that they had. 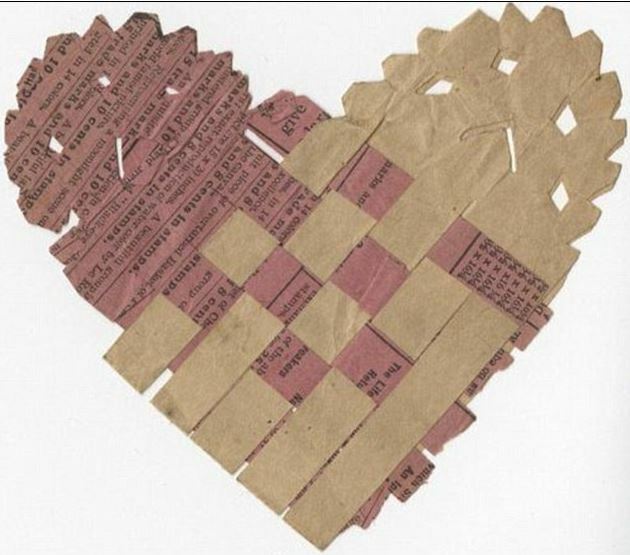 In 1862 Confederate soldier Robert King made this basket weave folded card for his wife from scrounged paper. Opened up it showed two crying lovers. A particularly sad foretelling of his death. 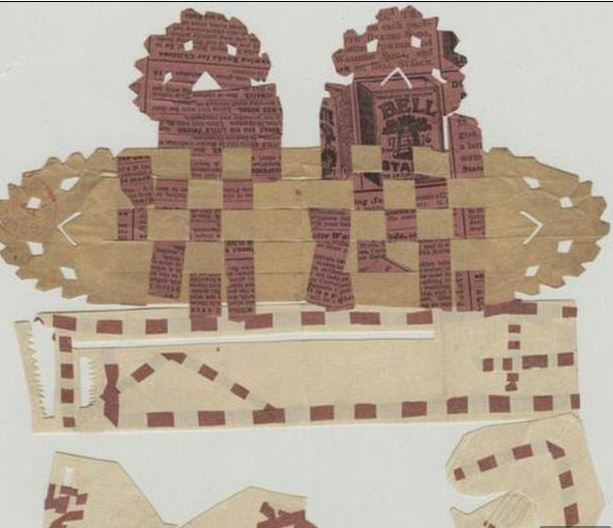 Soldiers also made folded cards like a Puzzle Purse by folding in the corners to make a paper pouch in which they would insert a trinket or lock of hair for their loved ones. Directions for making a Puzzle Purse can be found at these sites. Make one for a special someone this Valentine’s Day. This video also shows how to fold a puzzle purse.